Flora Siberica "Juniperus Sibirica" Silky Shine Shampoo for curly and mat hair carefully cleans, effectively smoothes and moisturizes, deeply nourishes and restores the hair, making it soft and elastic. 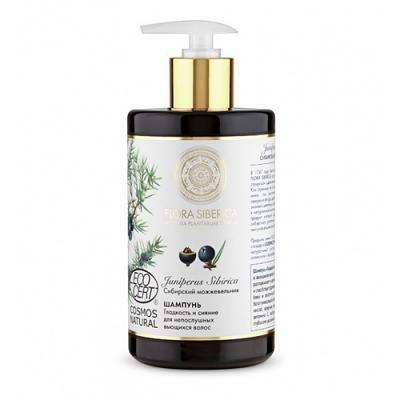 Siberian juniper is rich in a unique combination of tree resins, organic acids, essential oils with a high content of vitamin C, which contribute to the rapid and deep moistening of hair. Directions: Apply a quarter-sized amount to wet hair and lather. Rinse. Repeat if necessary. For best results, condition with Natura Siberica Conditioning Mask.